Whitney Tilson became famous as a short seller after legendary performance in the financial crisis. 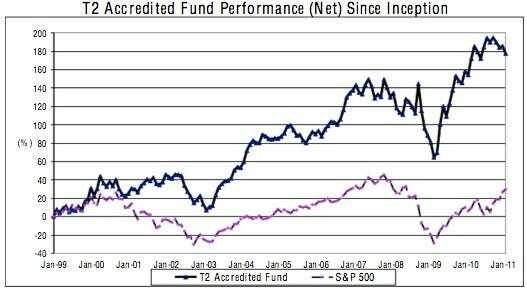 Since the second half of 2010, however, his fund at T2 Partners has been sucking wind. In January he lost another 2.8%, while the S&P500 gained 2.4%. Now he’s finally buying the rally (via Market Folly). Tilson’s investor letter says he’s reducing shorts from around 60% of his portfolio to around 30%. No word on which shorts he’s quitting — and as recently as last month he was defending his 10 largest shorts on the basis of fundamentals.